The FR Range: Warm lacquered, oak furniture in a French farmhouse style. Retreat to the chateau with the laid back, French farmhouse style of the FR range. The furniture is hand-crafted from oak and finished with a warm lacquer, which softens the natural grain of the oak. The antique style, silver, metal handles, along with the curved plinths are traditional in their farmhouse style. The dovetail joints and tongue-and-groove backs and bases give the furniture the longevity that consumers look for when choosing oak furniture. Bedroom pieces are available in the FR range. 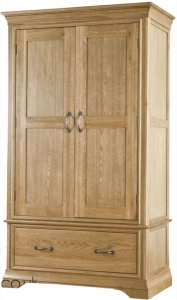 The natural grain of the oak is softened by the warm lacquer finish.